Lyonsdown School > News & Events > News > Lyonsdown School collected a record 137 boxes for the Charity Samaritans Purse! 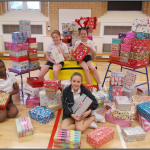 Lyonsdown School collected a record 137 boxes for the Charity Samaritans Purse! Monday 30th November our team of Year 6 charity monitors very proudly helped load the magnificent total of 137 Christmas shoeboxes into the collecting van. A huge thank you to all who contributed to this special effort where the Lyonsdown School community remember children who would otherwise receive no gift at all this Christmas. 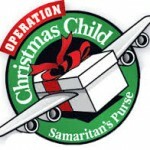 Our children too have gained much from the experience of gathering and giving these precious shoeboxes.